Teresa is a top-notch mechanic with more than 40 years of experience repairing everything from Porsches to school buses. Currently she teaches a basic auto-repair class for women. 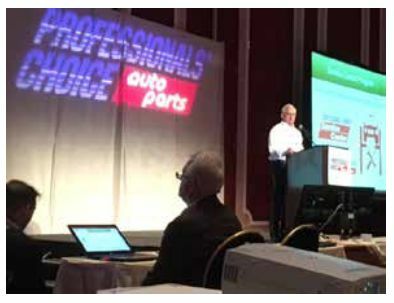 Recently I was invited to attend a national conference in Reno, Nevada being hosted by Automotive Parts Associates (APA) consisting of several automotive aftermarket parts companies. APA is a group of aftermarket companies working together to bring quality and competitive pricing to the consumer when dealing with aftermarket parts in the automotive industry. I was impressed with the concept of the conference because it was not just about bringing companies together and meeting each other, but to also discuss employee morale, how to maintain good employees, strategies and looking to the future in the automotive industry. Many of the big players were present at the conference; here is just a small list: KYB, TYC lamps, Loctite, Seymour Paints, Purolator, Valeo, Desno, AC Delco, Delphi and Federal-Mogul, who actually owns many of the aftermarket companies we have come to know and love. Like, Fel-Pro, Wagner Brakes, Anco Blades, Sealed Power, National Oil Seals and Bearings, Champion Spark Plugs, just to name a few. I had the pleasure of chatting with the folks from Federal-Mogul for almost an hour, and came away with a great understanding of their commitment to the automotive industry, their employees and their products. In this day and age, finding qualified technicians is becoming more of a challenge by the day. The industry as a whole needs to do more to inspire the young, up and coming employees who want to embrace becoming an automotive technician. So how can they accomplish this? This was discussed at the conference with knowledgeable guest speakers focusing on this very topic and how to execute it, to include maintaining your current employees. I recently learned the high school I attended and graduated from, is thinking about removing Auto Shop from its curriculum. Not because students are failing, but because no one is signing up for the class. To me, taking Auto Shop is more than just that; it teaches beyond auto repair, it offers teamwork, mathematics, problem solving, computer skills, working with your hands, communications, reading, writing and showing the students how to finish something you start and seeing the end result. With the future of automobiles leaning towards autonomous cars, engineering and robotic technicians will be in high demand. Tesla’s plants are already in the process of hiring a few thousand with these very skills. The conference embraced the fact that they need to be proactive in the future rather than wait until it is too late to hop on board. So working together to brainstorm and show off their newest products was a great sight to see. I did also manage to meet several women from these various companies and discuss their roles within their prospective employers, “Laura, Key Account Manager for Valeo”, Lisa, Sales Manager for Seymour Paints’, Cheri, Marketing Manager for Federal-Mogul; and Carol, Sales and Customer Service Manager for Stempf. All of these ladies I spoke to expressed their dedication and desire to inspire other women to join them in this industry. We all seemed to agree, women are still a small minority within the automotive industry, but those numbers are climbing. You do not just need to think of yourself as a mechanic, the automotive industry offers other positions, like Engineers, Accounting, and Service Advisers to Specialists. Many of these companies offer scholarship programs for students, and sponsor contests for all types of automotive enthusiasts: they will offer a sponsorship of cash and prizes to several contest winners, and a year sponsorship for the top winners in each class. So the next time you are in need of an auto part, make sure you choose a company that stands behind its product and offers quality to the name. When it comes to your automobile, your life depends on it. And if you know someone who would be perfect for this industry, give it a mention and help us to inspire.